Reminder: You must let me know via email/text if you are going to be out. Keep in mind Personal days need prior approval. After school: Reminder we have our next Professional Learning today on "Engagement." It will last approximately 30 minutes in the library. BLOOMS Charts: Please stop by to grab your Bloom's chart. Make sure you initial on the staff roster when you take yours. These need to be used when planning. Mr. Gallager will be here on Wednesday @ 8:00 to visit classrooms. Essential 5 skills you have determined as a PLC for the 2nd nine weeks. A copy of your common assessments you are using for your essential 5. Parent Conferences: Turn in documentation of your conferences. Please specify face-to-face, phone conference, or no conference per student. Students are engaged in the learning task and have applied learning to meaning. Students are actively thinking/responding to what you are teaching and are able to make authentic connections. Student does the activity being asked because they are told to do so. Typically compliant learners do not retain information being learned and they are not able to transfer what they have learned. 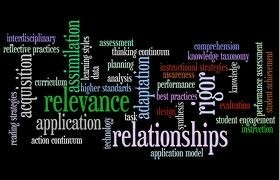 Remember......If you plan for rigor and relevance students are more likely to be authentically engaged. Rigor: Plan learning tasks focusing on the top two levels of Blooms. Relevance: Making a connection to the "real world." SHOUT OUT to Linda Fargo for a successful 2nd grade program!! SHOUT OUT to 2nd grade and expressions for being flexible and helping out with the program practices. SHOUT OUT to Copeland and Behrle for starting Literature circles. WAY TO GO first grade team!! You are doing an amazing job with your RTI kiddos! Thanks Teresa Potts for another successful Book Fair! Thank YOU Hrabal and Jeanie for always helping out when needed! You ladies ROCK! SHOUT OUT to ALL for successful conferences! The language arts are the building blocks when applying Common Core literacy standards to tangible, effects-driven actions in the real world.